Since the 1990s, KaTom has been the place to turn for restaurant owners, caterers and other food services professionals when they need everything from commercial refrigerators and cooling units to paring knives and flatware. KaTom is a restaurant supply super store with more than 100,000 products in its inventory of restaurant equipment and cooking supplies. With its wholesale pricing and promo codes, prices are lower than most customers expect to find. If you are opening a new food service location or updating your location with new equipment, KaTom has cost-effective and efficient solutions to meet your needs. The company works hard to keep ahead of the game so that customers will find the best selection at the best price. Starting with the basics, customers will find energy-star refrigerators and other appliances to reduce their utility costs, and eco-friendly to-go containers to reduce their impact on the environment. KaTom offers recycling bins in a variety of styles and sizes to accommodate clients that want to incorporate conservation and recycling practices into their business policies. Customers looking for efficient storage and portable cutting stations will appreciate the line of John Boos products available. Some of the finest wood-crafted cutting boards, roll around islands and hanging shelves are seen in the John Boos line. John Boos has been producing finely crafted kitchen items since 1887 and also makes wooden benches, stools and residential butcher block tables. Adding work space is often a must for culinary artist and sous-chef activities. KaTom has many stainless counters and work stations in varying heights and styles for consideration. Hanging and standing wire shelves put your storage where you need it. As for large appliances, KaTom offers gas grills, commercial ice makers, heating and serving lines and buffet tables. Everything from ice catch bins to the proverbial kitchen sink is available at KaTom to set up you food preparation and serving areas. KaTom offers customers a full line of bar supplies and equipment, too. If your business provides catering services for large parties, weddings or outdoor events, check out the many portable bars and bartending accessories available. Portable bars such as the 60-inch portable from Supreme Metal Marquise Series are designed to put everything within easy reach and are highly functional and easy to transport. The deep shelves and ample ice storage are convenient and this unit can be used as a stationary fixture. Many styles of acrylic display cases are available to showcase pastries, cakes or snack items. Everything you need to prepare food is available at KaTom, including serving accessories like molcajetes in a variety of sizes and table containers for salad dressings and spices. Running a successful food service business requires much more than just putting some food on a plate. Having the best equipment for food preparation and cooking gives a chef the advantage. 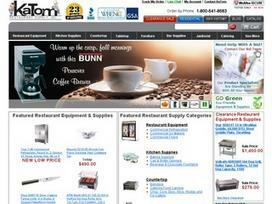 KaTom is the best place to go to find restaurant supplies and equipment. Share what you think about KaTom, and your favorite ways to save there!